Against some odds, Spotlight took home Best Picture honors at the 88th Awards ceremony. Among the eight films nominated, Spotlight blended into the fold perhaps a little too cleanly and emerged victorious as, a manner of speaking, default. In a series of films marked by quasi-historical narrative (well, not Mad Max: Fury Road or The Martian), Spotlight dug its roots into what makes us feel uncomfortable the most and asked the audience to respond in kind most visceral. 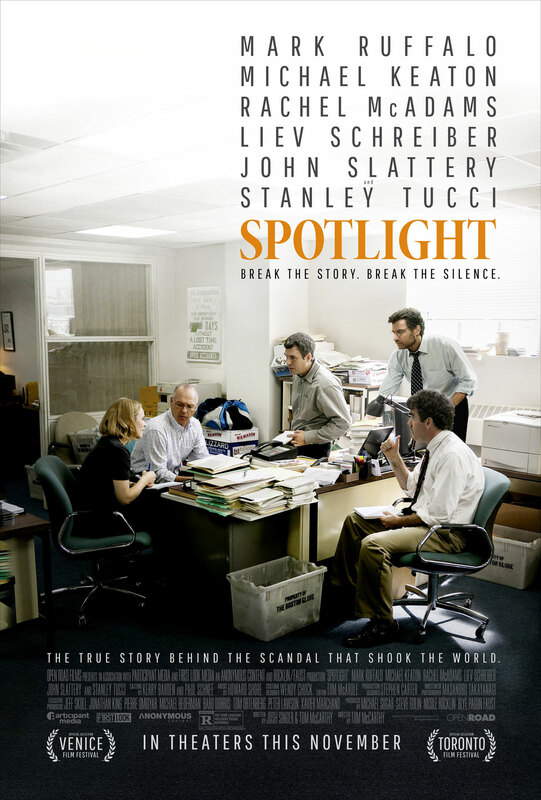 So: perhaps different from past winners, which all follow this idea of narrative gestalt to one of emotional response because Spotlight did not respond to anything in particular from the year; it did not wrap its gravitas around a suite of ideas that moved the nation. It worked, though, as a powerful inductive technique to bring a narrative into the public, well, spotlight, that had been simmering for many years. Does this abrupt shift signify a trend for the future? The future should be somewhat obvious (and surely looking back will prove this sentence one hundred per cent incorrect) to those with a finger on the pulse of an increasingly globalized political miasma. And yet, with all the uncertainty encircling coming national and international events, 2016’s winner this year will not feel like a coup of sorts. As of yet, though, the uncertainty of what awaits is pervasive and head-scratching. Navigating the movies slated for a 2016 release (in mid-May), nothing quite stands out as reflective of insurgence, political defiance, or identity politics. Nothing seems to spin off-center or unsafe. We must be cautiously frivolous, then, when guessing aberration or trend for Spotlight. Either way, this conversation has shifted for the better and its win brings a fresh sense of thematic ignorance (bliss) and polishes the jade so deeply ingrained. Here’s the kick, then. Spotlight asks an important question via its narrative: why do people care about pedophilia’s horrors now, of all times? Without the film, does the narrative draw even a sliver of the same kind of attention – ever? The meta-narrative runs deeper: does a film about investigative journalism receive a nomination or a win without the deeply disturbing subject matter? The former: no, the latter: yes, and these responses require attention to the even larger global pulse: technocratization and the shift to learning-via-bombardment from learning-via-curiosity. We learn by sifting through noise now, so a poignant and strong signal to one issue that we might traverse deductively (with the help of a strong team of actors and crews) resonates, hard. The latter capitalizes on these relative strengths of an ensemble cast and an award-winning director. This clout could drive almost any film to success; so much so that many of the seven other films (The Big Short, Bridge of Spies, Mad Max: Fury Road, The Martian, or The Revenant) could have rested on their laurels in the same way. But still: what separated Spotlight from odds-on favorite The Revenant? Whimsy. The logic follows that certain inputs can “predict” certain results, to a degree of accuracy. Almost every decision (based in this specific econometric science) follows these criteria, from the routing of a new highway or transit line to a go/no-go order in sport or in war. A decision-maker will weigh options to the best of his or her knowledge and in turn rely on the experience of others to refine and reflect as well. The Oscars’ inputs are themselves random in a way (voting is very human), thus making the “winner” distinction based more on gut than on past performance, per se. The eventual winner very well could have been any of the seven other films. We could be writing about Room as the Best Option to have dealt with human trafficking and psychological distress. Many would argue that it should have emerged victorious. But when we “predict” the winner using ANP‘s qualitative, loose guidelines, then certainly, Mad Max: Fury Road would have won if not for a certain pervasive political figure and ideology that closely reflects Mad Max‘s main antagonist, Immortan Joe. Go figure.